I learned how to make oven roasted chicken recipes because they were becoming so popular year after year. It may be that people favor the taste of chicken or it could also be that it is so economical to serve. Many people do not like having so many leftovers when preparing a larger bird like a turkey. This year there was a large increase is serving an oven roasted chicken recipe over a turkey for the holiday dinner recipes. When it comes to meat there is not much that can compare with the versatility of chicken. When you learn how to make oven roasted chicken recipes, you should know the storage of that chicken is important. A chicken should not be stored in a refrigerator longer than two days. If you are not going to use it that soon then make sure it is wrapped properly and placed in the freezer for up to six to eight months. When ready to use thaw a day in the refrigerator, rinse it under cold water and pat dry with paper towels. Don’t forget to remove the giblets from the cavity; I know people who have done so. When you lean how to prepare for your oven roasted chicken recipe, you will want to place the washed and dried chicken on a clean cutting board with breast side up. If you are not going to stuff your bird, season the inside of the cavity with your favorite spice blend. If you choose to stuff it, prepare one half cup of stuffing for each pound of chicken; pack it lightly in the cavity and truss. Before placing the chicken (stuffed and unstuffed) in the oven brush the bird with oil or melted butter and season with your favorite spice blend. As the chicken is roasting, baste with melted butter occasionally. Although it has been “traditional” to place the chicken breast side up on rack in roasting pan, everyone should try roasting one upside down. (See roast chicken cooking time for more information). This method of roasting has become the favorite of many people. With this method the chicken is first placed in the roaster with the breast side down for part of the roasting time. This position allows for the fat from the darker meat to naturally baste the drier white meat of the breast. 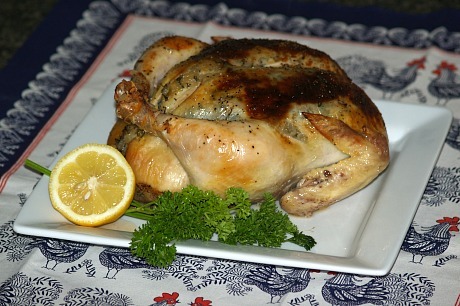 The chicken is then turned over for the remaining time allowing for the breast side to roast to a golden brown color. I have a friend who likes all her chicken with a crust; even the oven roasted chicken recipes. She mixes three tablespoons of softened butter with about 3 tablespoons flour to a paste mixture. She then rubs this all over the top of the chicken; breast and legs. After placing the chicken in a hot oven (about 400F degrees) the crust starts to turn brown. At this point she reduces the heat to the normal chicken roasting time and continues to cook the chicken. Several times during cooking she will baste with melted butter and sprinkle with a little more flour. I have never used this method but I have eater my friend’s chicken. When the cooking is complete (about 1 ½ hours for a four pound chicken), it makes a very pretty presentation and I do believe the crust seals in the moistness of the chicken. Generally speaking, you need to roast a chicken at 350F degrees for thirty minutes per pound for chicken less than four pounds; for those that weigh over four pounds allow twenty two to twenty five minutes per pound. Below are some very good oven roasted chicken recipes; follow the instructions in each one that you choose to make. NOTE: Anytime during the chicken roasting time if the chicken begins to brown too much make a foil tent to prevent overbrowning. 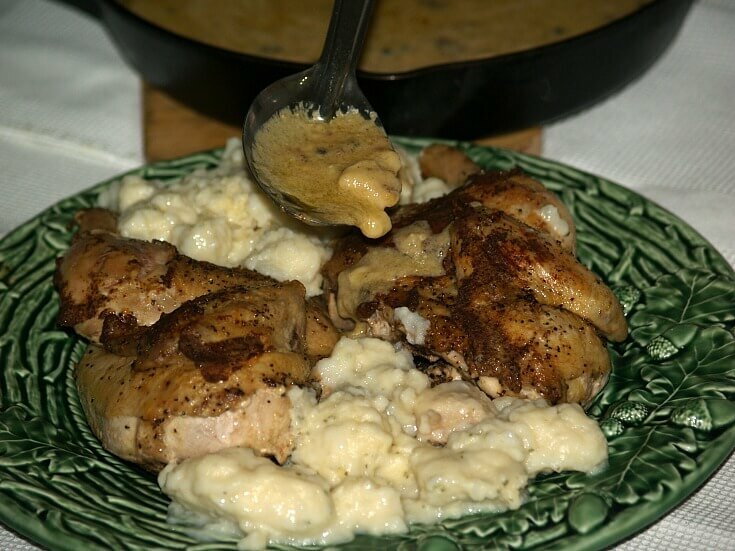 Learn how to make roasted chicken with a delicious mustard cream sauce. Cut chicken lengthwise in half (Half of breast, leg and thigh in each half). NOTE: I cut with large butcher knife. You can have butcher do it. Sprinkle each chicken half with pepper, salt and 1 teaspoon dry mustard. Place breast side down in hot skillet with a little oil; cook until browned. NOTE: If you do not have skillet large enough brown one at a time. Place chicken halves breast side up in large skillet or baking pan. NOTE: If using a baking pan, save the skillet for making sauce when chicken is done. Brush Dijon mustard over the chicken halves. Place in oven and bake about 75 minutes or until the chicken is tender. Move chicken to a warm platter; cover and keep warm. 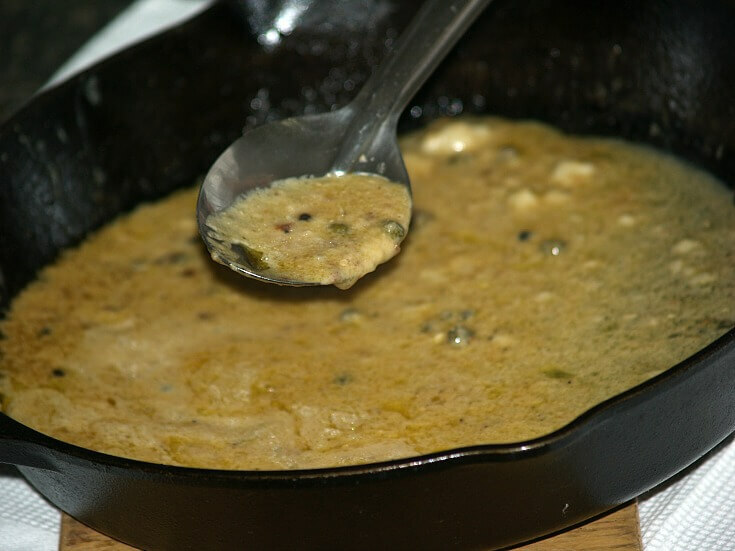 Combine remaining 2 teaspoons dry mustard, cream, white wine and peppercorns in skillet. NOTE: If you Baked in another pan, pour drippings back into original skillet. Cook mixture stirring constantly until sauce thickens slightly; serve over chicken. Serve with dumplings; serves 4 to 6. ROAST CHICKEN WITH APPLE SAUSAGE STUFFING This oven roasted chicken recipe makes a great holiday dinner recipe; pretty presentation and delicious taste. To make stuffing cook sausage over medium heat in a 4 quart saucepan stirring until browned. Remove sausage to a bowl; discard drippings reserving ¼ cup in pan. Cook apples, onions and celery in pan drippings until tender about 10 minutes. Remove pan from heat and stir sausage back in pan; add bread crumbs, eggs, salt and seasoning. Remove giblets from chicken; rinse with cold water and drain well. Spoon some of the stuffing lightly into neck cavity; fold neck skin over stuffing. With breast side up lift wings up toward neck then fold under back of bird. Spoon remaining stuffing into cavity of bird; fold skin over opening and rub bird with melted butter. Bake any leftover stuffing in small cover casserole during last 30 minutes of chicken baking. Insert meat thermometer into thickest part of meat between breast and thigh without touching bone. Place chicken breast side up on rack in roasting pan. Roast uncovered at 325F degrees for 2 ½ to 3 hours; when thermometer reaches 180 to 185F degrees. Sprinkle chicken pieces with salt, pepper and oregano on all sides. 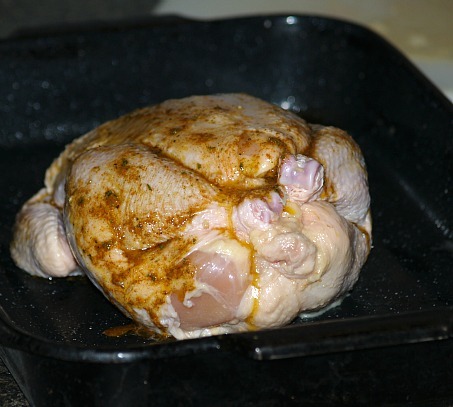 Melt butter in baking pan; place chicken in pan. Pour lemon juice all over; arrange chopped tomatoes over the top. Bake in preheated oven at 350F degrees for about 50 minutes or until golden brown and tender. Potatoes can be placed around the chicken and roasted. 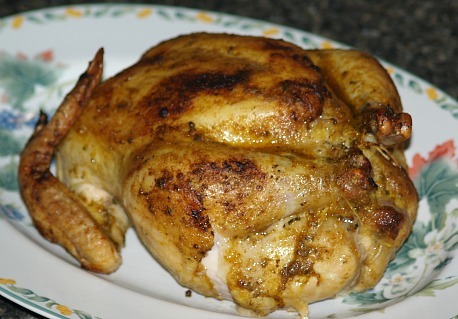 This is a delicious, very flavorful oven roasted chicken recipe. 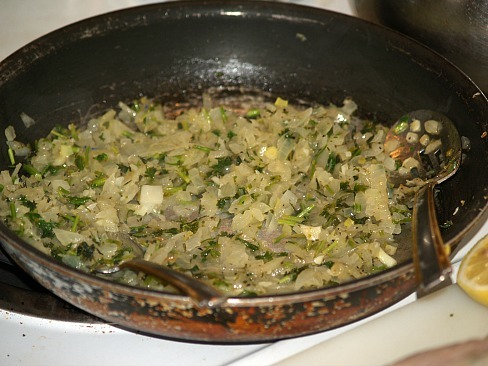 Heat oil in large skillet; add onions and garlic and sauté over moderate heat until tender. Add the parsley and thyme; season with salt and pepper and cook about 1 minute. Stir in butter and lemon juice and cook just until the butter melts. Scrape the herb mixture onto a plate and let cool to room temperature. Carefully loosen the chicken skin starting at the neck being careful not to tear it. Push about ¾ of the herb mixture under the skin working it all over the breast legs and thighs. Stuff remaining herb mixture into the cavity of the chicken. Tie the legs together and set the chicken on a rack in a roasting pan. Roast chicken basting occasionally about 1 hour and 25 minutes or until tender and done. This oven roasted chicken recipe will feed a crowd of about twelve people. Rinse and dry chickens; rub skin of each with one clove of garlic. Stuff the cavities; each with 1 bay leaf and 3 cloves of garlic. Place 1 tablespoon of butter herb mixture in each cavity of each chicken. Place chickens in roaster; baste with remaining butter herb mixture.